As the world mourns the death of the “Queen of Soul”, Aretha Franklin, memorials all over the City of Detroit have paid respect to the musical icon. Franklin passed away Thursday morning at her home along the city’s riverfront after a battle with pancreatic cancer. She was 76. Franklin moved to Detroit when was four, when her father, Rev. C.L. Franklin, became the pastor of New Bethel Baptist Church on Linwood Avenue on the city’s west side. Franklin attended Northern High in the city’s predominantly black North End neighborhood and was a proud representative of the city up until her death. 1. 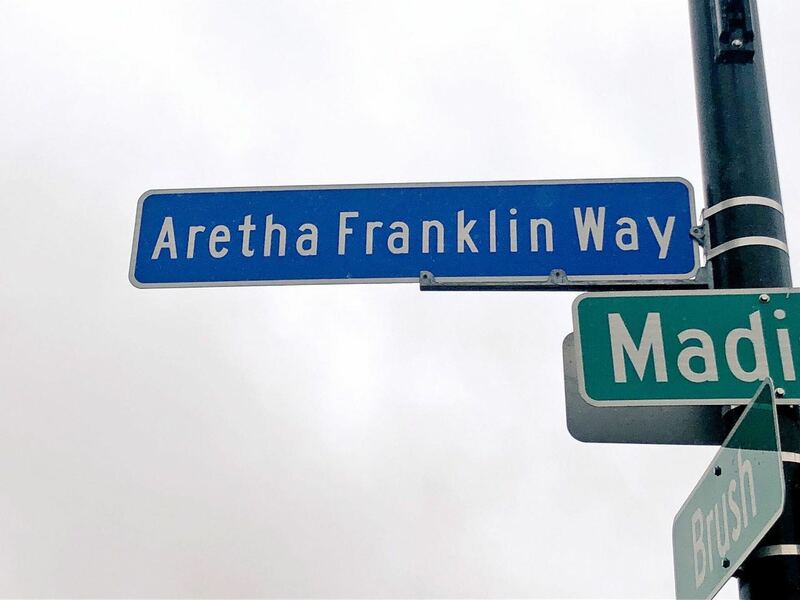 The City of Detroit named a section of Madison in front of the 36th District Court after Aretha Franklin in 2017. Fans put balloons and a teddy bear on the pole in her honor. 2. Cobo Center showed respect for the Queen of Soul with this electronic billboard above the tunnel to the Lodge Freeway. 3. The Fillmore Detroit Theater spelled the word “Respect” on its marquee for Aretha Franklin. 4. Just as many many entertainers from the City of Detroit have, Aretha Franklin performed at the Fox Theatre many times. Its famous marquee had the word “Respect”, along with “Forever our Queen” on it. Comerica Park and Little Caesars Arena did the same. 5. Romeo, Michigan native Kid Rock has a restaurant inside of the Little Caesars Arena. It paid homage to Aretha Franklin on its marquee. 6. Aretha Franklin’s father, Rev. C.L. Franklin, was the pastor of New Bethel Baptist Church in Detroit from 1946-1984. This is where the got her start, singing solos for her father in church. The church on Linwood Avenue was littered with media from all over the country and fans paying their respect to the Queen of Soul. 7. The Music Hall has a slideshow on Aretha Franklin on its sign that reads, “Forever our Queen of Soul.” The corner of Madison and Brush is named in her honor.